There is no one alive who is you-er than you!" Here is Jennifer and Hannah being silly while they wait for the school bus. Thanks Libby for a great quote. For my September lift challenge I have chosen a layout that is ideal for using up your scraps, as we all have lots of those. 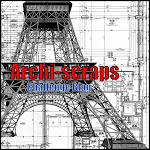 It is an easy design and one which you can quite easily adapt to incorporate you own style of scrapping. I found this design was simplistic which allows for easy interpretation. You are welcome to take whatever you can from the scrap lift example…….it could be the title, the colours, the embellishments, or even scrap lift the whole page. It took me 4 tries to get this right, I almost gave up. Hannah came into my scrap room and said that was really cute photo of her and Alex, so she gave me a guilt trip , so I had scrap it. Thanks Hannah! Finally I got some time to go my Blog it's been a busy and heck summer for me. I'm going to upload my August Layouts. 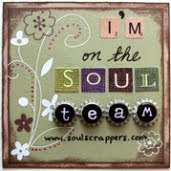 Beginning of each Soul Scrappers has a Guest Designer, So now I want to welcome Lisa Rea. She brings us New and Fun Challenged called Tic Tac Toe. the bottom row, using journaling card , 4+ patterned paper and Banners. friend. we call this SUMMER TIME Fun.